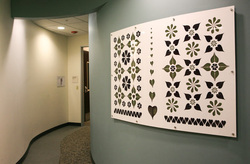 It is proven by science that art from nature in health care facilities aids in patient healing. Tara Gill’s work offers versatile botanical patterns made to fit any surface. A fusion of retro and modernity, Tara Gill Studios designs lend elegance, refinement and unusual beauty to fabrics, paper, and home decor. These timely, clean, botanical designs will please the plant and garden enthusiast, and lovers of beauty and design.